Does anyone else love pasta salads as much as I do? They are really one of the perfect side dishes for summer. Especially when they don’t have mayo in them. The dressing on this Tomato Feta Pasta Salad is really what gives it an edge. Whirl some capers, garlic, olive oil, sun-dried tomatoes and red wine vinegar in a food processor, season with salt and pepper and taste how this dressing rocks the pasta. It’s a major big step up from just an oil and vinegar combo but equally as easy, tangy and full of deliciousness. YUM! The rest of the recipe is really easy to tailor to your individual tastebuds. My family loves anything with sun-dried tomatoes, Kalamata olives and feta cheese, but throw in whatever you love. It’s best when made ahead of time as the ingredients get the opportunity to meld together and bring out the best flavor. I’m salivating already. Is it lunchtime yet? Do you have any pasta salads that make you the star of the party? Share your favorites! 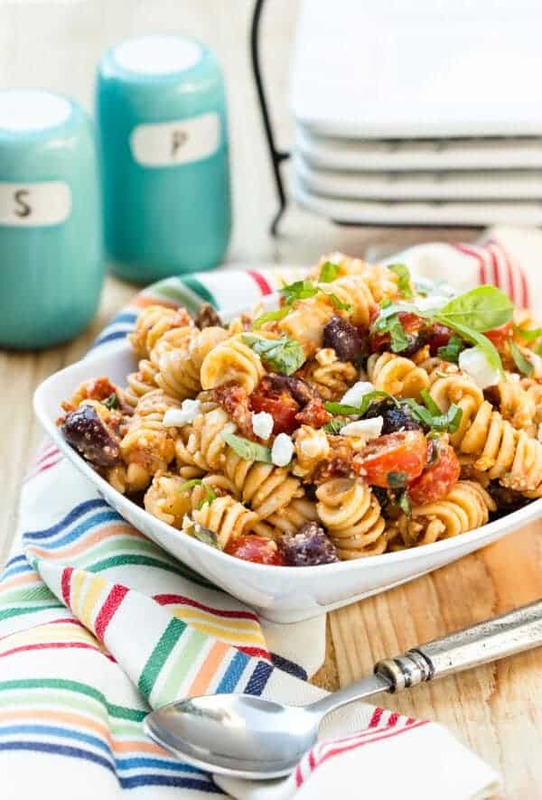 A tangy pasta salad filled with tomatoes, feta and Kalamata olives. Cook the pasta in a large pot of boiling salted water with a splash of oil to keep it from sticking together. Drain well and set aside to cool slightly. 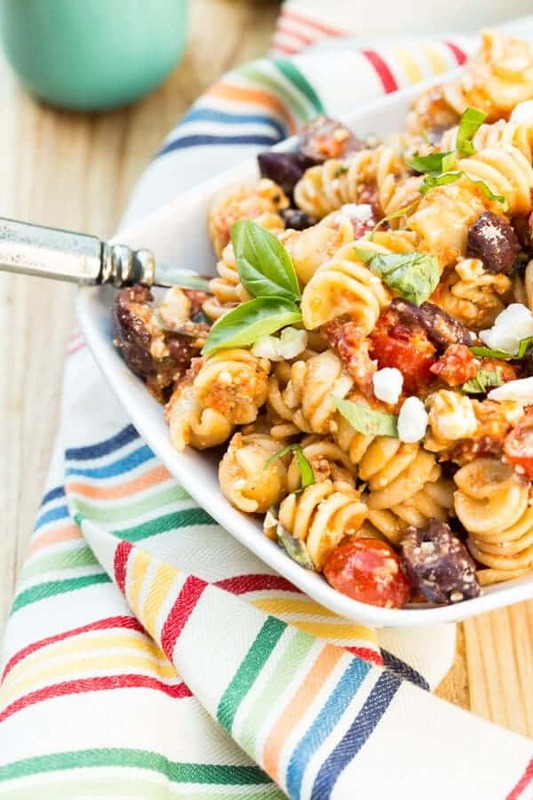 Place the pasta in a large bowl and add the tomatoes, olives, feta and chopped sun-dried tomatoes. In the bowl of a food processor, combine the sun-dried tomatoes, vinegar, olive oil, garlic, capers, and pepper and pulse until almost smooth. Pour the dressing over the pasta, sprinkle with the Parmesan and basil and toss well. Stir gently before serving. Hey ladies! I love cold pasta salads. I have one that I make up with sun dried tomatoes, pesto, kalamata olives and shredded chicken. I haven’t posted it yet, but you have now inspired me to make a batch and post it soon, that is when the weather gets warm again. It’s been like winter here, low 60’s and foggy rain drizzle. June is known in Northern California as June gloom. Heading out to MN in August from the 3rd till the 13th. I would love to hook up with you both. Yum! I LOVE pasta salads during summer. The heat is already unbearable here in Texas so this dish sounds like a perfect meal! I saw your beautiful picture on CCN FB page and just had to come over ;). I don’t really have a recipe as I just like to dump and mix anything I have in the fridge. I should try writing it down sometime haha. Pasta salads are my favorite! I love a Greek Salad Pasta salad. I want to try this one–love the capers! This is one of my absolute favorite salads, probably the one I’ve made most over the years. Except I use chunked fresh mozzarella instead of feta. My family loves this as well, it’s a win-win. SO GREAT to meet you girls in Austin! I just made this tonight and it was a hit with my whole family. Thanks for the recipe! Love it when it hits the jackpot with everyone! Thanks for stopping by. This looks awesome! We love cold pasta salad in the summer. Pinning this to make sure I don’t forget! This salad is definitely a keeper…and a crowd pleaser! 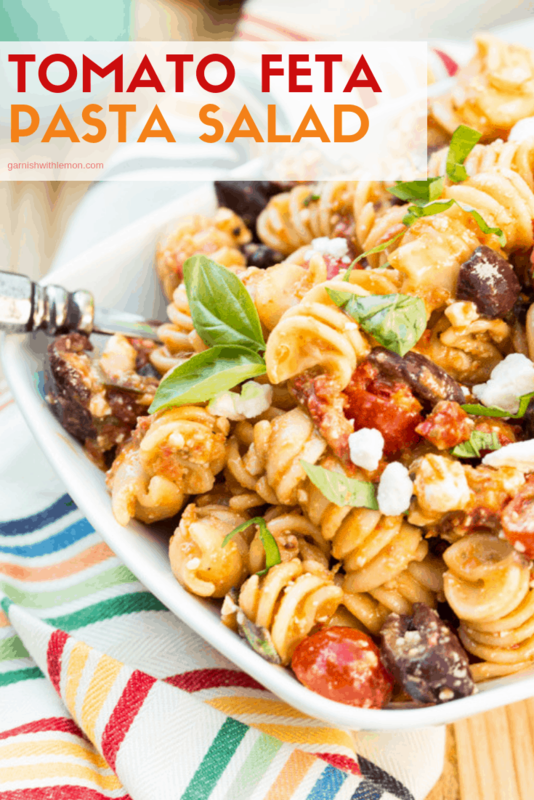 I LOVE pasta salads and I usually switch between a Greek and Italian recipe for parties. This looks delicious too! Let us know how it turns out! It’s our summer go-to recipe!